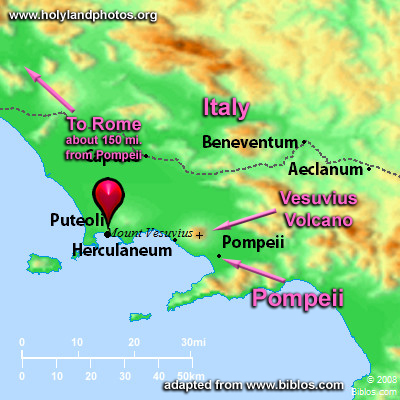 Puteoli is where Paul landed and where he spent a week there with "brothers" before beginning his land journey to Rome (Acts 28:13–14). The modern name of the place is Pozzuoli and it is located west of Naples. It was a very important harbor in Roman Times. Most of the ancient travelers to Rome would land here and then follow the Via Appia into the city—as Paul did. The large Roman grain ships, bringing grain from Alexandria Egypt, also docked here, but they usually continued on to Ostia, the port of Rome, where they would off load their cargo. It was a Roman Colony and many elite Romans had villas here and at nearby Baia. The Roman naval base was at close by Misenum. The city was/is located directly over the caldera of a volcano and thus there were/are many thermal baths here.